Prof. Dr. Martin Winterkorn, Chairman of the Board of Management of Volkswagen Aktiengesellschaft, and the U.S. Secretary of Transportation Ray LaHood have today inaugurated the new Volkswagen Group plant in the United States in the presence of prominent representatives from politics, business and the media. In Chattanooga, Tennessee, over 2,000 employees are to produce up to 150,000 vehicles per year. The plant sets new standards in terms of sustainable, resource-efficient production. 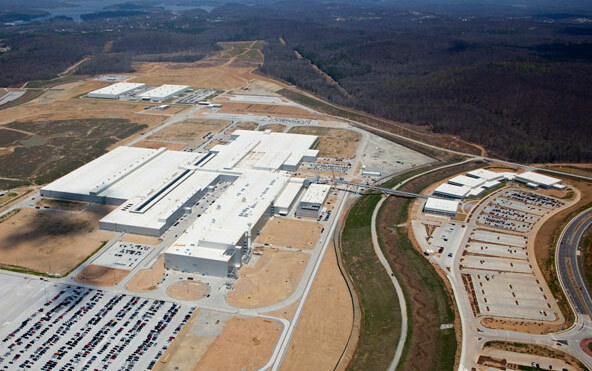 Since construction started in 2009, an automobile plant including body shop, paint shop, assembly facility, technical testing center, academy for the initial and advanced training of employees, and a supplier park with eight companies has been built on a 1,400 acre site in Chattanooga. The design production capacity of the plant is 150,000 vehicles per year. The manufacturing depth for the Passat produced here will be of the order of 85 percent. 1,700 people are already employed directly by Volkswagen in Chattanooga. 10,000 additional jobs will be created in the U.S. component supply industry. 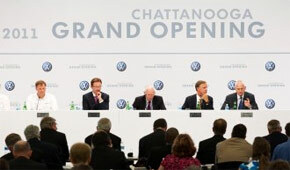 Volkswagen is investing about one billion US dollars in the development of the facility at Chattanooga, which will be among the world’s most advanced and environmentally compatible automobile plants. The new plant is in line with the highest requirements of the U.S. LEED (Leadership in Energy and Environmental Design) standard, which lays down stringent provisions for the sustainable, environmentally compatible construction of buildings. One of the key measures taken at the plant is the use of a painting process without any filler, which reduces CO2 emissions by about 20 percent. Water efficiency at the plant also meets the most stringent requirements. 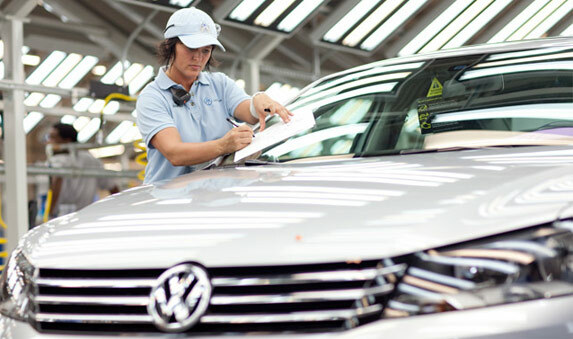 Volkswagen has built the world’s first automobile paint shop to use a waterless separation process for topcoat application. Thanks to the use of collected rainwater, water consumption at the Chattanooga plant is also considerably lower than at facilities of a comparable size. In addition, the U.S. plant is the first Volkswagen facility to rely entirely on energy-saving LED systems for outdoor lighting. The production buildings and offices are also equipped only with energy-saving lamps controlled by motion sensors. The entire lighting system of the plant uses some 20 percent less energy than a comparable facility. The United States is one of the world’s largest and most important automobile markets. The new U.S. plant lays the foundations for Volkswagen to meet its target of boosting Group sales in the United States to more than a million vehicles per year by 2018 at the same time as winning a market share of about six percent for the Volkswagen Group. The U.S. Passat from Chattanooga, specially tailored to meet the needs of American customers, and the Jetta produced in Mexico are key elements in Volkswagen’s offensive in North America. The next generation of the iconic Beetle will pick up the threads of the brand’s legendary heritage in the U.S.